So I thought I was onto a good thing with this simplicity pattern. 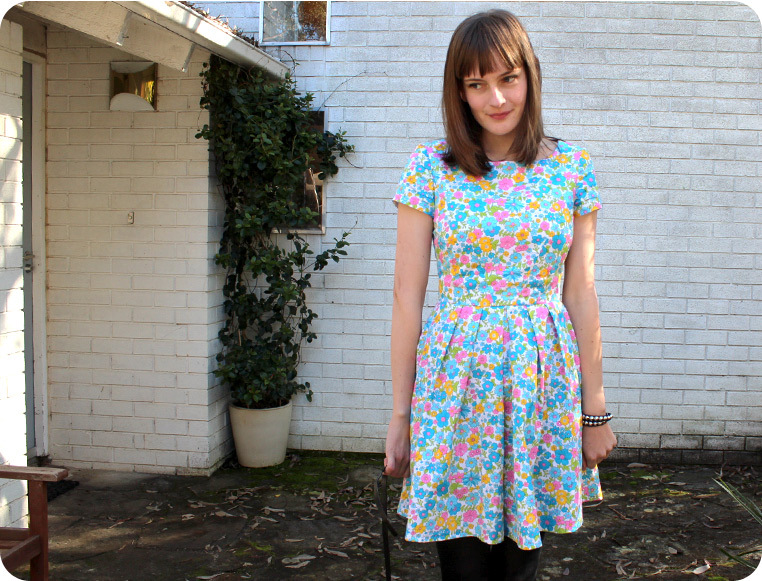 At the moment I am all about only sewing in fabric you love so thats just what I did. I have had this fabric for years and I was always waiting for the right project. 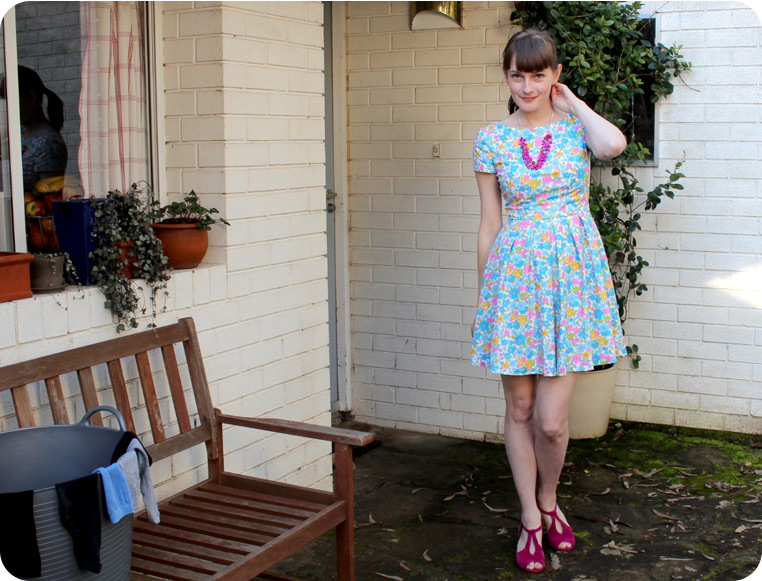 The floral print on the cotton fabric I used has a kitschy late early 70s feel that I love! Does anyone see a pattern here ;)?. Now I have a dress rather than another fabric sitting in a box waiting to be made into the perfect dress…Perfect is never going to happen. Cute is good enough! I am trying to kill my boring sewing-perfectionist and just make stuff. Yay for using the good/fav fabric! I did get a little too complacent while sewing, in other words I was not paying enough attention. 1. Forgot the lining trick and my lining and fashion fabric got tangled because I sewed the sleeve hems while the lining was INSIDE the bodice. Note to self:The bodice of the fashion fabric and the lining should have right sides together BUT when sewing the sleeve hems lining should NOT be inside the fashion fabric. The lining and the fashion fabric should be opposite each other/mirror images and only meet at the middle at the sleeve seams. Thats not how you do it! good thing I could retrace my steps and fix it. 2. I forgot to clip the inside of skirt and bodice at the waist seam. Also I overlocked the pleats when I wasn’t supposed to. Mainly to help them stay down. Not clipping the waist seam means it pulls a little at the waist. 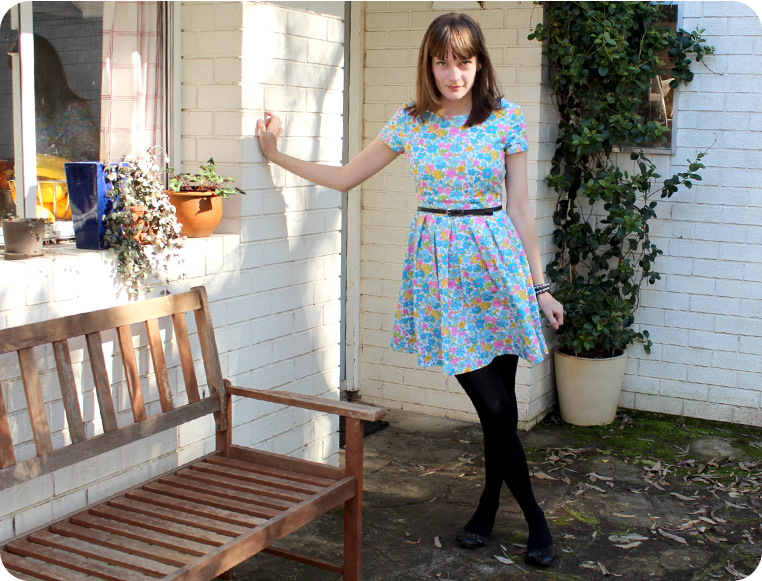 You can see a little bit of bunching near the waist in the photos. I think I may fix this…but so much unpicking and re-stitching involved…hmm….should I? I probably should. The pulling sort of bothers me and it CAN be fixed. Its just so tedious to re-visit/fix a recently completed project. 3. I did not pay attention to the notes I wrote about the order of construction.I sewed the bodice lining to the skirt BEFORE inserting the back zipper between the fashion fabric and the lining. So I had to unpick. Doh! I write good sewing notes for myself, only problem is I forget to read them. I decided that I was getting way too fanatical about fit of my sewing projects and that a little more ease was OK. With past projects I have made muslins and test run after test run of each dress and it is such a tedious process that I would loose motivation to complete the project and go slightly crazy in the process. 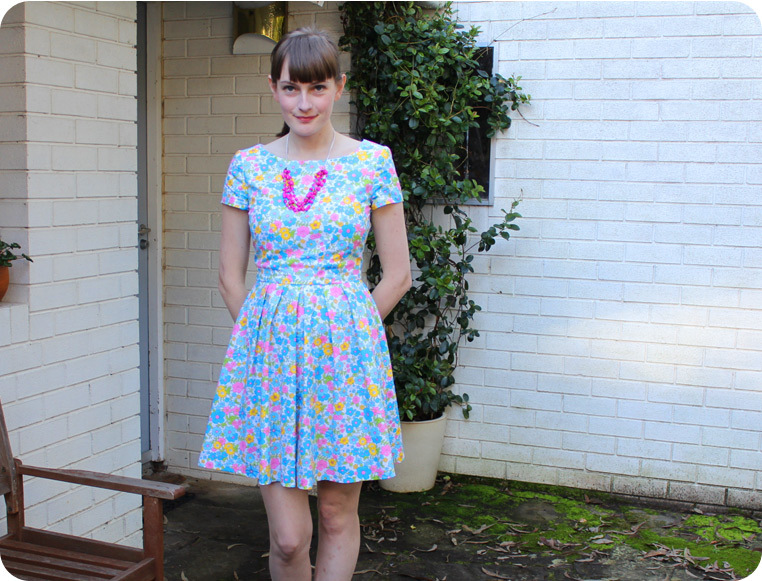 I find when I buy RTW I am nowhere near as fussy about fit or finish than when I make stuff myself. This boring perfectionism had to end and I decided to cut straight into my fashion fabric fit be dammed (ok so it WAS a cheap fabric I have had for years). But the fit of this pattern turned out to be pretty good already (aside from a tiny tiny little bit of gaping at the neckline). 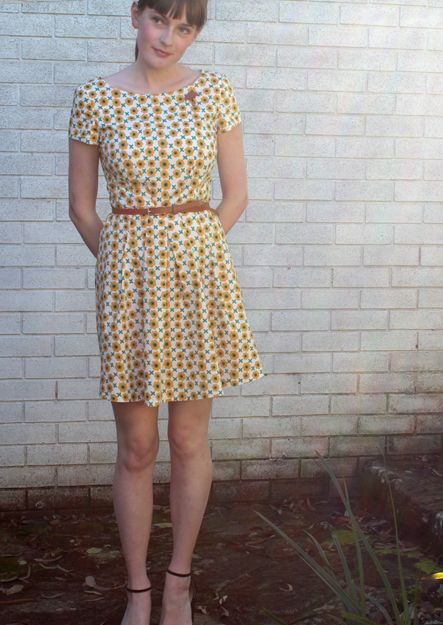 I am loving the pattern and I think Simplicity 2444 will be a new go-to pattern for me! 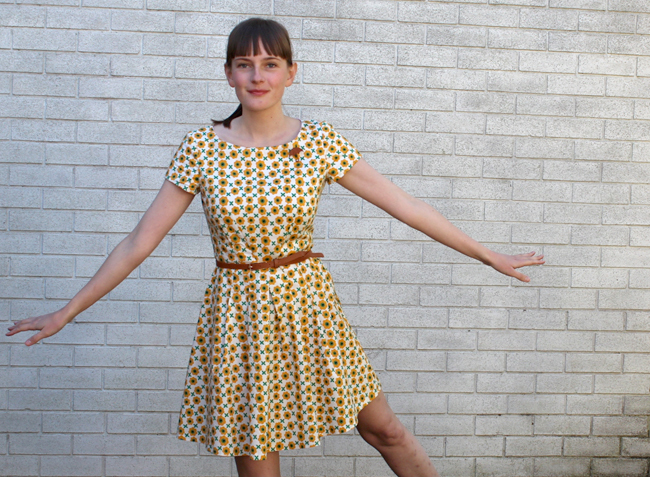 I saw the amazing potential of this pattern after seeing it used by so many other seamstresses. 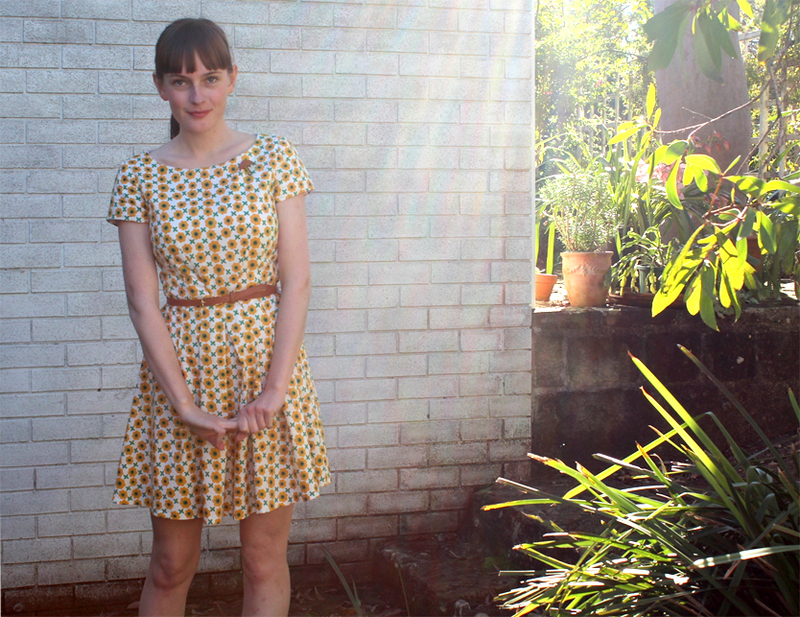 These are my favorite versions of the dress: Adventures in dressmaking, Sew many happies and Dapper duds. 1. I omitted the facings and finished the edges by lining the bodice. Because I think, in a dress like this facings can be VERY annoying (not sitting flat and always popping up while you are trying to wear the dam thing)…So when possible just say NO to facings! hehe. 2. I took about 12cms of the skirt. 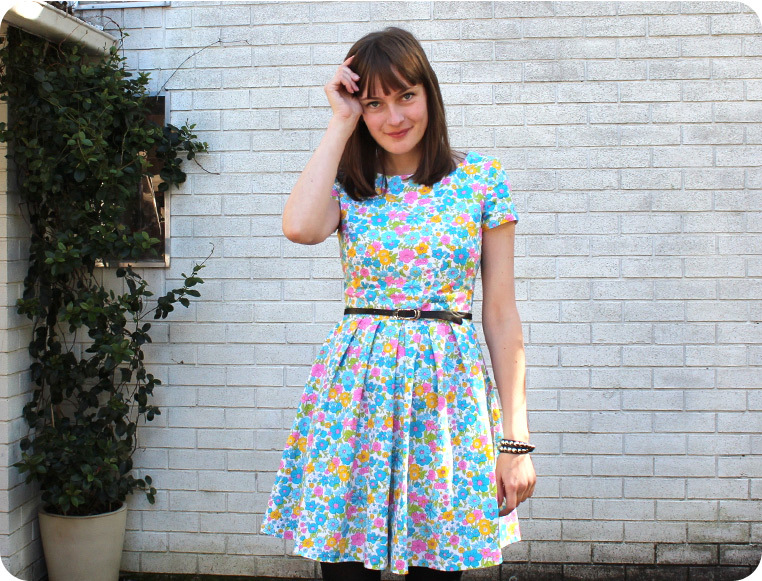 I like a vintage-inspired look but I am partial to a shorter, more modern hem length particularly on a more prim dress like this one. 3. I sewed the pleats on the skirt a little differently to the instructions…I sewed them together at the lines (rather than just basting) and then basted them in the opposite direction to what was suggested (towards the belly/center). I like how this gives the pleats a more subtle look. But in the next version I make I am going to try it with the more exaggerated pleats which are pressed towards the hips and only basted on top. 4. omitted the center front seam on the skirt (cutting around the whole front skirt as one piece/putting the center front skirt seam on the fold). The thing I am most excited about is the fact that I managed to get a clean finish whilst lining the bodice and the sleeves without ANY hand sewing. If you are new to this blog you have yet to learn of my rather unhealthy hatred of hand sewing… it’s sewing machine for me ALL the way! I will post a tutorial on how to to this (or: “How to line a bodice which has sleeves with a clean finish”). I was SO HAPPY I found out how to do this. That totally gave me nerdy sewing joy. LOL. BTW: IT was far too cold to wear this dress today 😦 I only wore it for the photos. I am not a fan of winter! ummm…. I am not so good at posing…obviously. I had my galaxy tab with me so when I had an Internet I could keep up everyones sewing projects and secretly lurk blogs while I was away. That sounded unintentionally sinister but what I meant was I haven’t commented while I did not have access to my physical computer but I still got my sewing-blog fix! 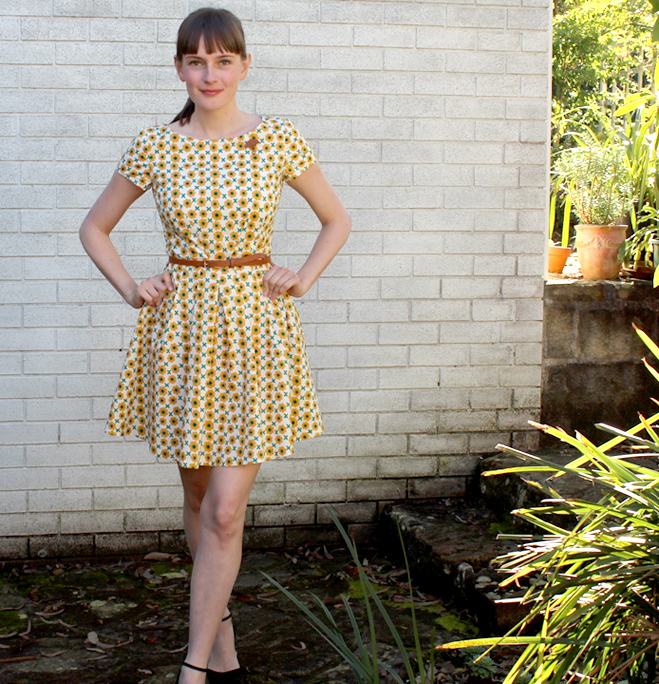 I recently completed simplicity 2444 without making a muslin and reveled in its lack of fitting issues. Such a great pattern! No pictures of that yet but I will post some soon! But OK enough writing. 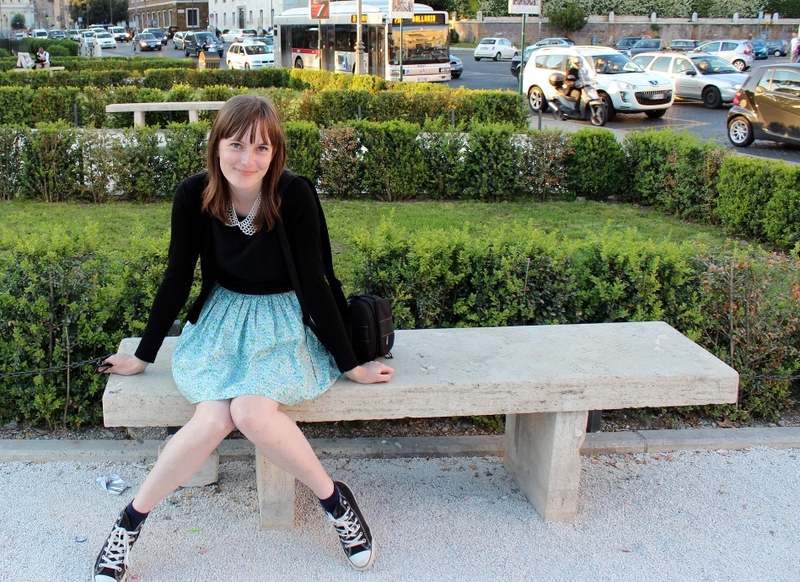 Here is me in Rome wearing the simple elasticated skirt I made (from this post).